Social Tagging Systems (STS) empower users to classify and organize resources and to improve the retrieval performance over the tagged resources. 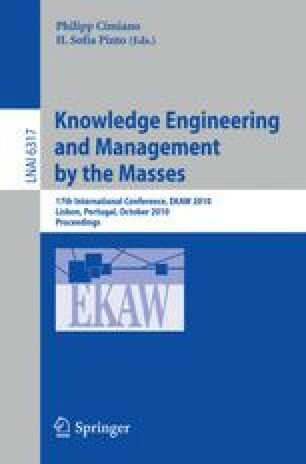 In this paper we argue that the potential of the social process of assigning, finding, and relating symbols in collaborative tagging scenarios is currently underexploited and can be increased by extending the meta-model and using this extension to support the emergence of structured knowledge, e.g. semantic knowledge representations. We propose a model that allows tagging as well as establishing relations between any pair of resources, not just objects and tags. Moreover, we propose to use this extension to enrich and facilitate the process of building semantic knowledge representations. We (1) provide a formal description for our approach, (2) introduce an architecture to facilitate semantic knowledge derivation, and (3) present a preliminary experiment.